Saturday activities, your pick of Injanation, Locked Room, Archery, or Luge. Join us for our annual Calgary Midsingles Conference, June 2-4th, 2017. This year we have multiple options in order accommodate the needs and budgets of everyone attending. The early bird base rate for the conference is 40$ with prices increasing depending on which Saturday afternoon activity you choose. Activities are first come first serve so register early to secure your spot. If you wish to wait and sign up for an activity on the day of the conference you will miss out on the group rates and there may not be availability left for your preferred activity. Christina Williams has been practicing yoga for nearly 10 years and completed her yoga instructor training in 2014. She loves exploring the different types of yoga and continues watch her own yoga practice and teaching style evolve as she learns. She has a Master of Science degree in plant science and works for a feedlot consulting company managing research trials. Raised on cattle ranch outside of Cardston, AB Christina is passionate about agriculture and treasures her family, her ranch, the mountains and her cows. This yoga class will explore breathing techniques and foundational poses combined in a gentle flow. This class will be suitable for anyone wanting a good morning stretch. Note: Please wear comfortable athletic clothing and bring your yoga mat! Learn to play the Ukulele–the easiest instrument you will ever play. Learn a brief history, chord progression and start playing!!! It is so fun! You will sound like a pro by the end of class! Born and raised in Glenwood Alberta. Graduate from U of Lethbridge (General Humanities). Certificate in digital audio from SAIT. Love music and food more than most things. Kami Norris loves food, especially chocolate! She is a Red Seal Baker and Pastry Chef with a BSc. in Dietetics from Kansas State University. I love food and I know you do too! Developing a healthy relationship with food and a healthy relationship with our body is key to a joyful life….but it can be hard, male or female. I love to combine my culinary and dietetic education to help others improve upon their health habits, and find joy in food and in their own skin. Daily nutrition is more than a diet plan, ps-I don’t like diets, it’s about our bodies, mindset, food culture, body image, culinary skills, food sources, and all the delicious foods we have available to eat. This class will explore a deeper understanding of nutrition and food to guide you to more joyful health. Justin Maier was baptized into the church in 2001 and has loved dancing ever since. In 2010, while living in Vancouver, he attended his first salsa lesson. He felt an immediate interest and passion for the Latin dance style. After taking lessons and going to salsa parties regularly for a few years, he started performing salsa at various locations and venues. Some of these performances included choreographies that he created. His favourite salsa performer is Adolfo Indacochea, from Italy. Justin’s involvement in Latin dancing also includes other Latin styles like Bachata, Merengue, and Cha Cha. Today, he still dances regularly, but usually just for fun. Dr. Tingle received in B.Ed. In Elementary Education from the University of Alberta, with a minor in Educational Psychology, before obtaining her Masters and then Ph.D in Marriage & Family Therapy from Brigham Young University. After interning for LDS Family Services in Baltimore Maryland, Anne Margaret married and moved back to her hometown of Calgary to practice as a Marriage & Family therapist for Kelly Lutmer and Associates as well as for LDS family services. Anne Margaret also served for several years on the Board of Directors for the Calgary Counseling Centre. Five years ago Anne Margaret opened her own private practice. In whatever time is left over after her duties as a wife, mother of four, and Family Therapist, Anne Margaret enjoys exercising her skills as an interior decorator on behalf of her company Sparkush Design, the training for which she completed at Mount Royal University in 2010. Understanding depression and anxiety: what is depression and anxiety, how they are treated and how to help family and friends who suffer from it. There are between 5 and 6.3 million Syrian refugees. Canada has accepted 40,000 so far. I became friends with the Siho family as part of volunteering with Calgary Catholic Immigration Services. In this presentation you will learn about why there are so many refugees, the Siho family’s own experience leaving Syria, and what you can do to help. Aaron Nelson has been involved with Calgary Catholic Immigration Services since April 2016 as a refugee integrator with the purpose to help Syrian refugee families integrate into Canadian life. Getting to know the Siho family has opened his eyes to the Arab and Islamic worlds as well as the realities of the refugee crisis. Local entrepreneur & business owner Steven Phan will be hosting a workshop on starting your own business with special guests Rick Romeril, President of Kaizen Automotive Group and Gregory Petersen Senior Partner of Corporate Finance with Gowlings LG. Steven Phan has an associates degree in business management and has been involved in several start-up businesses of his own ranging from import/export of products, web development, eCommerce, software development, real estate investment, and landscaping since he was 14 and is currently running a successful small family business servicing major electronics and appliance brands. His passion for business and entrepreneurship has lead him to many failures as well as many successes. Kyle McNeil lives in Calgary with his wife Annelisa. Kyle has spent the last 15 years learning about relationships, communication, marketing, teams and leadership. He’s a University of Alberta graduate, entrepreneur, and has coached individuals personally, and in group settings for the last 6 years. In addition to a love for his wife, family, work, reading, writing, cycling, breakfast smoothies and the Edmonton Oilers! One of his hidden talents is taking panoramic shots on his iPhone. Kyle is looking forward to sharing some of the most impactful and simple things that helped him go from a struggling single to having healthy and positive friendships, that ultimately lead him to marriage. InjaNation saw an opportunity to design a safe indoor trampoline park and obstacle course where individuals, family, and community can connect for fun and explore core fitness. Fashioned after a shift in the fitness industry towards functional movement seen in obstacle course racing and on American Ninja Warrior, as well as drawing from fundamental attractions like wall climbing and indoor trampoline facilities, we decided to create a giant one-stop Calgary indoor playground for all ages. We believe in coaching each individual to explore their “inner ninja” using movement and their imagination to create experiences that enhance their life in a supportive and team-based environment. Playing, training, and inspiring all abilities and ages from one to one hundred and one! Trampoline grip socks will be included in admission rate. Looking for Calgary attractions with a unique twist? Skyline Luge Calgary is a fun, fast-paced family activity that people of all ages and abilities can enjoy. It is a ‘must do’ activity during summer in Calgary, Canada! The Luge is a unique wheeled gravity ride that provides riders full control over their descent on a purpose built track. Experience 1.8 kilometres (5905 feet) of twists and turns dropping over 100 metres (328 feet) in its course. It’s the world’s longest Luge track yet! Originating in New Zealand in 1985, Skyline’s Luge is one of the most thrilling Calgary attractions, and has been enjoyed by millions of people from around the globe. The summer Skyline Calgary Luge track runs alongside the famous Winsport Olympic Luge track and is Calgary’s favourite family attraction for all ages and abilities. At SmartyPantz escape rooms, you and your group of intrepid adventurers are led into a themed room, provided with a back story by one of our in-character hosts, and given 45 minutes to solve a series of physical puzzles to “escape” the room or accomplish some other relevant objective. Spies & Lies – The War Is Over, But Your Mission Has Just Begun. It’s 1946 and the war has finally ended, but your mission has just begun. As war criminals flee to all corners of the globe, you’re sent by the RCMP Special Branch to break into a crooked private eye’s office and discover the identity of a nasty Nazi so that he can be brought to justice. It’s not as simple as it seems, though. The detective’s office is locked up tight and even if you make it in, you’ll have to slip out undetected. Can you find the information before he returns? Dream’scape – Insomnia Never Felt So Good. Morning Never Comes – Your Head – Use It Or Lose It. You have been brought in to help with the paranormal investigation of an old, abandoned house. If the rumours are true, the victim of a grisly murder haunts the study, and no one survives past midnight. The doors have been locked behind you, and it soon becomes clear that you are not alone. If you’re going to get out of the house, you’ll have to find a way to break the curse before the clock strikes midnight and you become the spirit’s next victim. Thirst for Murder – Escape Has Never Been So Draining. Is there such a thing as eternal life? Your captor thinks so. You are trapped in a nightmarish basement and about to fall victim to a killer’s psychotic and cannibalistic quest for the fountain of youth. There a glimmer of hope though; you’ve been left alone and there may be a way out. Can you escape before you fall victim to the killer’s thirst for murder? Thirst is definitely not for the faint of heart. There will be blood and Beetle, your host, hasn’t been fed lately. 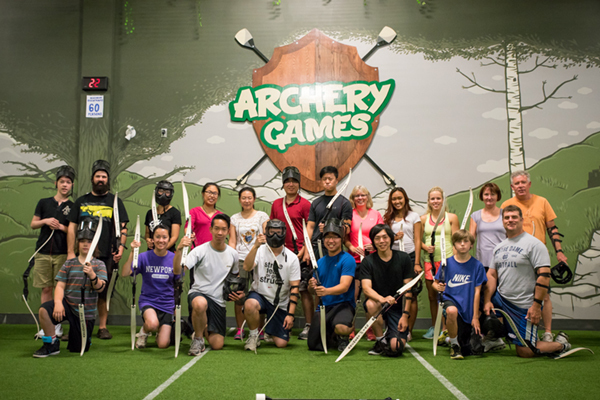 Archery Games Calgary provides the ultimate action-packed battle experience that is fun for people of all ages. The game allows 2 teams to battle each other in an arena similar to dodge-ball in that the objective is to strike the opposing team’s players in order to eliminate them from the game. 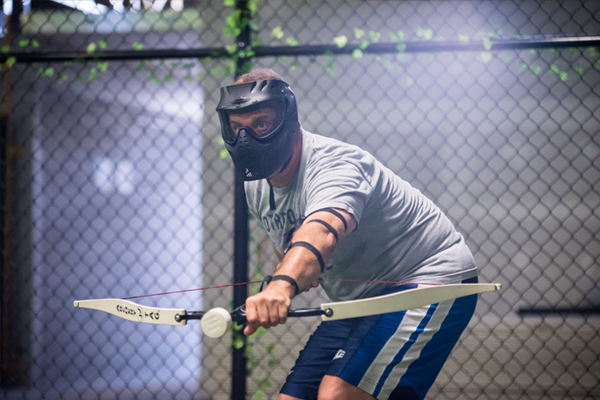 The main difference being that instead of throwing rubber balls at each other you will be equipped with bows, foam-tipped arrows and helmets!